A strong-armed, drop-back passer, the New Jersey native, after three years at Notre Dame (1946-1948) where he led the Irish to a 9-0-1 record in 1948, moved on to a 15-year career in professional football (1949-1963): four in the NFL (Detroit Lions, Chicago Cardinals), seven in the Canadian Football League (Saskatchewan Roughriders) and four in the AFL as QB for the Denver Broncos. He held all of the Broncos’ passing records until John Elway came along – except one that will never be broken: Tripucka threw the first touchdown pass in AFL history. When Frank Tripucka played football he was simply known as “The Trip.” And what a trip it’s been, from his days as a skinny high school quarterback in Bloomfield, New Jersey, to college and pro football and then the business world. Today, he and his wife, Randy (Jewkes) live in semi-retirement in Essex Fells, NJ, play golf, garden, travel a lot, and enjoy their seven children and eight grandchildren. Tripucka owned a Miller beer distributorship for 23 years, retired and then got back in business running a plastics company. One of his children is well known to Detroit area sports fans. Kelly, a former Notre Dame All-American basketball player, played five seasons for the Detroit Pistons. The first stop for “The Trip” back in 1945 was South Bend, Indiana. He played four years at Notre Dame and was a member of two Fighting Irish national championship teams in 1946 and 1947. During Tripucka’s collegiate career, Notre Dame compiled a 33-2-3 won-lost-tied record. After Lujack won the Heisman Trophy and moved on to the National Football League, Tripucka became the No. 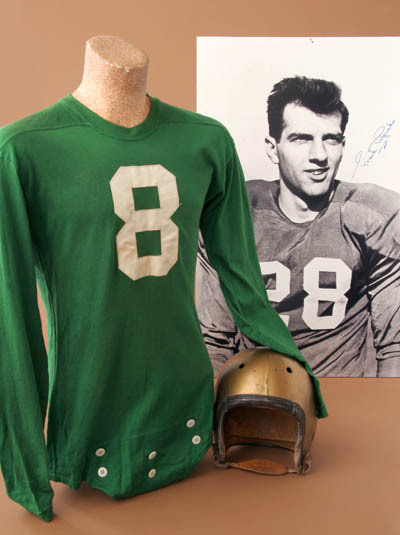 1 signal caller and led the Irish to a near-perfect season in 1948. “We finished second in the Associated Press poll to Michigan by only two votes because we tied Southern California 14-14 in the last game of the season after nine consecutive victories,” he said. Notre Dame had a controlled offense and Tripucka threw only 91 times that season, completing 53 for 660 yards and 11 touchdowns. His favorite target was another Polish Hall of Famer, Leon Hart, who caught four TD passes. The Trip’s next stop was professional football after playing in the East-West Shrine and Chicago All-Star football games. The Philadelphia Eagles made him their No. 1 choice in the NFL draft, but traded him to the Detroit Lions before the 1949 season began. After starting at quarterback as a rookie, Tripucka played in the next three seasons for the Chicago Cardinals. Next came seven years in the Canadian Football League as the star passer for the Saskatchewan Roughriders, coached by Frank Filchock. The “Trip” retired from football in 1963 after 15 pro seasons and held all the Denver passing records until John Elway came along and started to break them one by one. One accomplishment that can never be broken is that Tripucka threw the first touchdown pass in the history of the AFL. The Broncos thought so much of Tripucka’s contributions to the franchise that they later retired his uniform No. 18. The only other Denver player at the time to have his number retired was great running back Floyd Little (No. 44). In addition to his family and business, Tripucka has been very active in community affairs for years. He is a past president of the Lions Club, Boys Club, Essex Chapter of the National Football Foundation and Bloomfield Basketball Boosters, plus being an active member of the NFL and Notre Dame alumni clubs. Being elected to a Hall of Fame is nothing new to Tripucka. He has already been enshrined in the following halls: New Jersey Sports, Colorado Sports, Denver Broncos Ring of Fame and Bloomfield NJ Sports. The latest stop on Trip’s trip is here, in the Detroit area, at the National Polish-American Sports Hall of Fame.